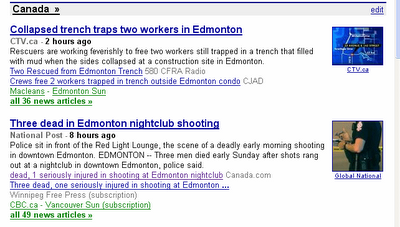 Thats's right: Edmonton is front and centre in the national scene today. It reminds me (vaguely) of Colby Cosh's article from last year bringing up Edmonton's murder rate in comparison to the hysteria over a single dead girl in T.O. I'm afraid I have no cave-in or murder insights at this time. Maybe later. Update, 10:33pm: More violence information has been added to the post below.